Next month, my mum and dad in law will be celebrating sixty years of marriage, it's not often you have to make a card for a diamond wedding anniversary is it? 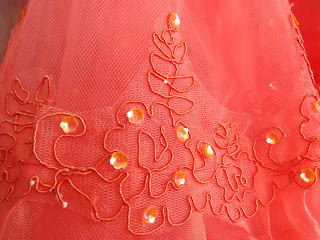 the flower was handmade using a scalloped edge punch . 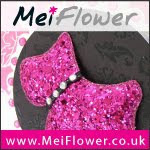 Meiflower have a 20% off sale on their sequin flower blossoms at the moment, I love these and often use them on my cards, a group together make great flower centres, or a few dotted amongst a flower arrangement adds an extra special touch, but, for a completely different use, my friend Donna, added some on to her daughter Chloe's party dress to make it extra sparkly (Chloe can never have enough sparkles, LOL! 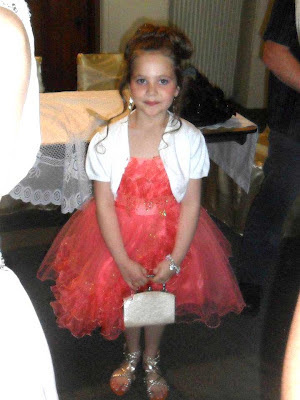 she is a real girly girl. 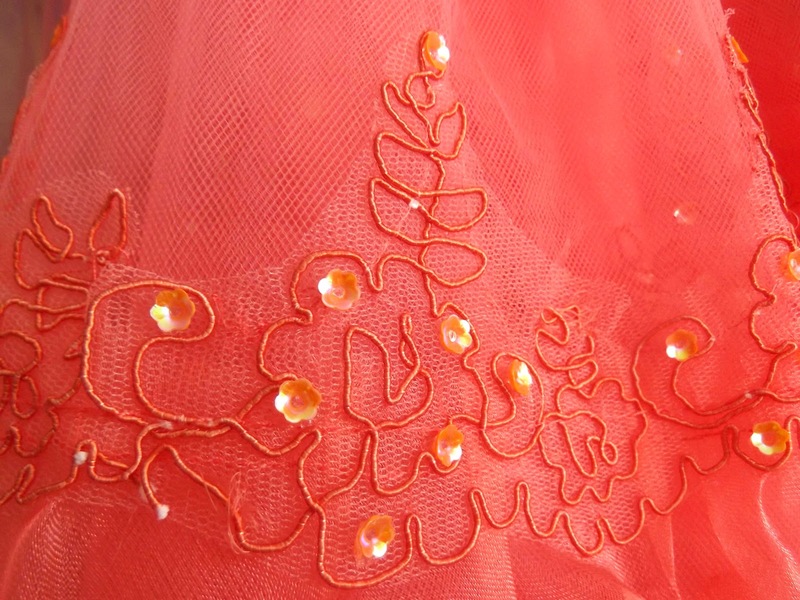 and here is a close up of the sequins around the bottom of the dress. Which just goes to prove that craft embellishments are not just for cards LOL! 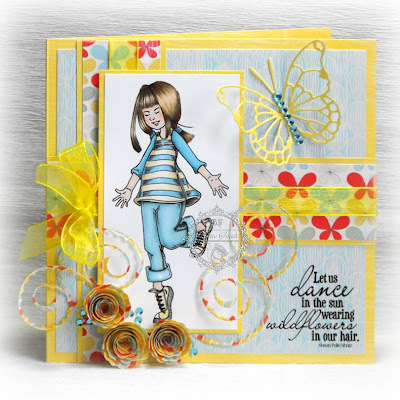 Why is it that boy cards are so hard to do, probably because most of us prefer adding flowers and sparkles and bows, which is not quite right on a boy card. I love the coloured cord that Mei has in store for boy cards, it's the perfect thing to tie around buttons, stars etc., not quite as girly as ribbon. 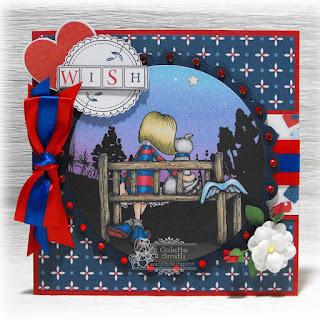 On this card I have wrapped it around the raised panel and also the stars, it just adds a bit of something extra to the card don't you think?! 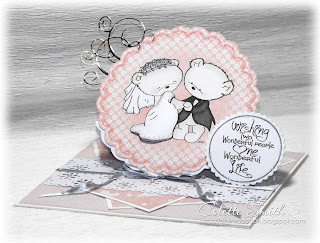 here is a weding card i have made for a friend who is getting married today ,the stamp is from LOTV ,the fabby ribbon and pearsl are from meiflower crafts . Hi, thought I would pop these two cards on to show you what I've been up to recently. I love using gems or pearls down the body of my butterflies and also placing them around my flowers in little groups of three. I laid 10mm satin ribbon across the middle of the wide satin ribbon before attaching to my card, I also made my bow in the same way. Now's definitely the time to stock up! 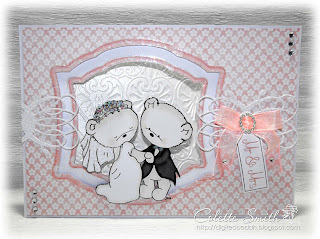 Here is a card i have made using some of the new wedding ribbon from meiflower crafts . 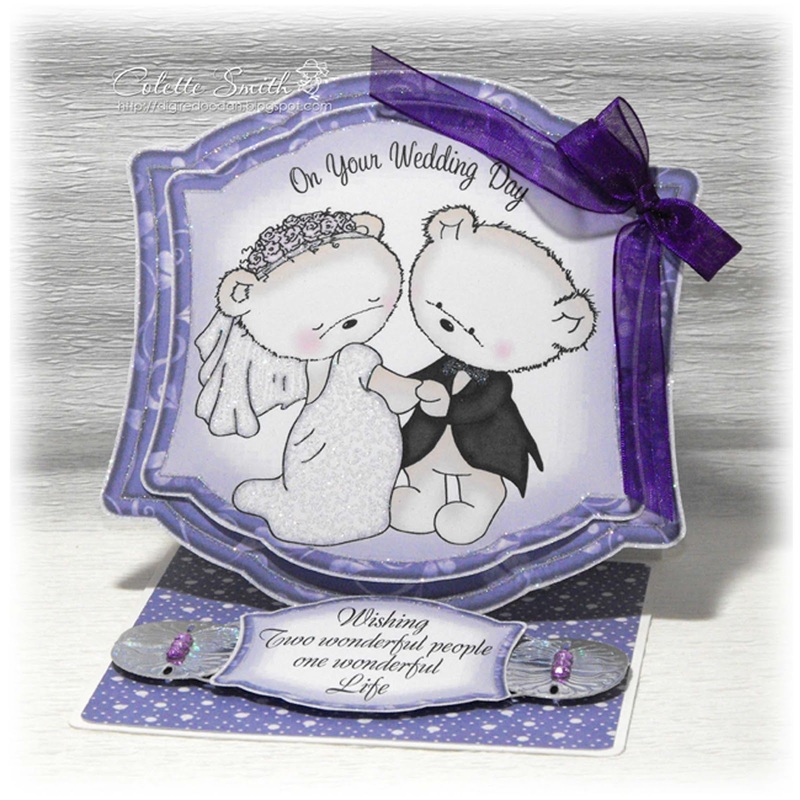 The Clipart Fairy has some new kits in store called Wedding Bears, both interactive and ready to print kits in pink and lilac. Meiflower ribbons, pearls,gems and diamanté buckles are the perfect embellishments for wedding cards so here are a couple I made with the new kits and Meiflower goodies. Easel card decorated with purple organza ribbon and lilac gems. Tent card decorated with silver 4mm satin ribbon and gems. The tent card also turns into a mini easel card. Some of the colours of ribbon and small oval buckles are new stock and not yet up on the website, if you are looking for a particular colour or item it is definitely worth sending Mei an email as they have a lot of new colours in all their ribbons, and have you seen the lush new wedding ribbons, definitely going on my shopping list. and have you seen the lush new wedding ribbons, definitely going on my shopping list.